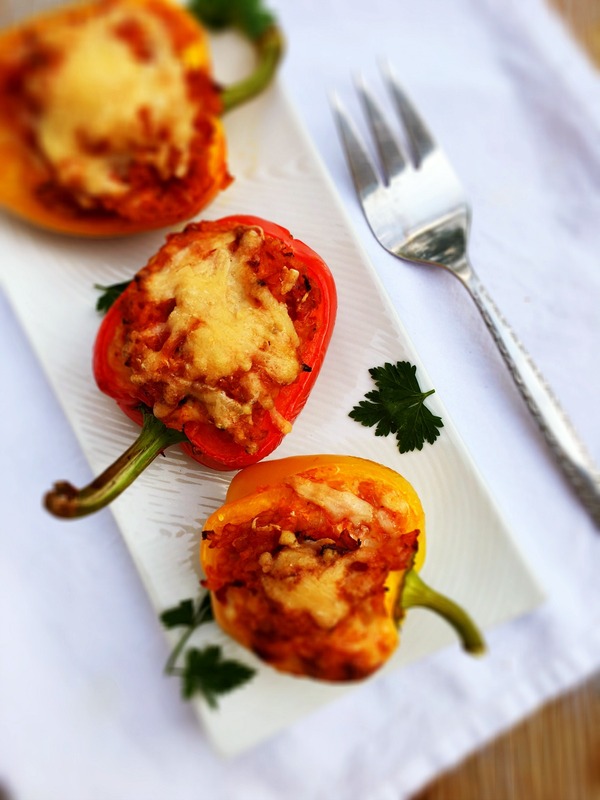 sweetsugarbean: Fire Roasted Tomato Stuffed Peppers & A Muir Glen Giveaway! 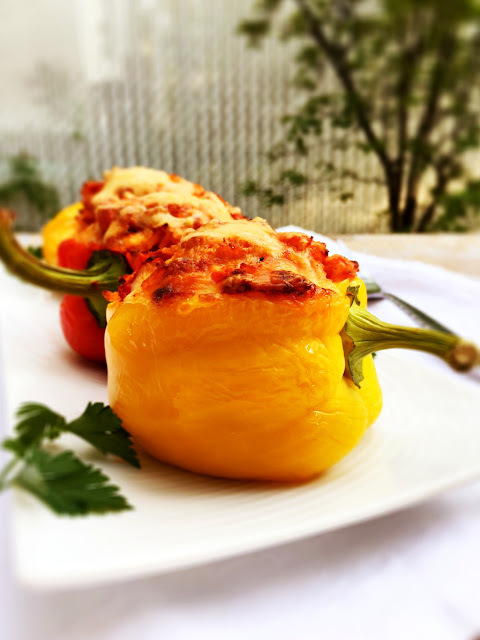 Fire Roasted Tomato Stuffed Peppers & A Muir Glen Giveaway! With the recent glorious weather here in Saskatoon, can I just say how much I love eating outside? Last night it was dinner and this morning it was breakfast. There is something quite spectacular about sipping coffee while the robins sing from the treetops. As the sun shone through the leaves, falling on my rock garden, it’s as if the ferns were unfurling before my eyes. This summer stuff is going to be good stuff. I’ve got a feeling. A handsome man came for dinner last night, which is all kinds of fantastic right there, but we sat outside for the first time this year and that made it extra special. Plus, there weren’t any bugs yet, so bonus points for that. On the menu were toasted turkey meatloaf, bacon and cheddar sandwiches as well as these gorgeous stuffed peppers. Muir Glen, the makers of fine canned organic tomatoes I’m sure you’ve seen on store shelves, graciously gave me the recipe to share with you. They are launching 4 new types of canned organic tomatoes this spring and have a contest to celebrate the tomato love. The winner will receive a $50 President’s Choice gift card, as well as 1 can each of Fire Roasted Diced, Fire Roasted Crushed, Plain Diced and Crushed with Basil. 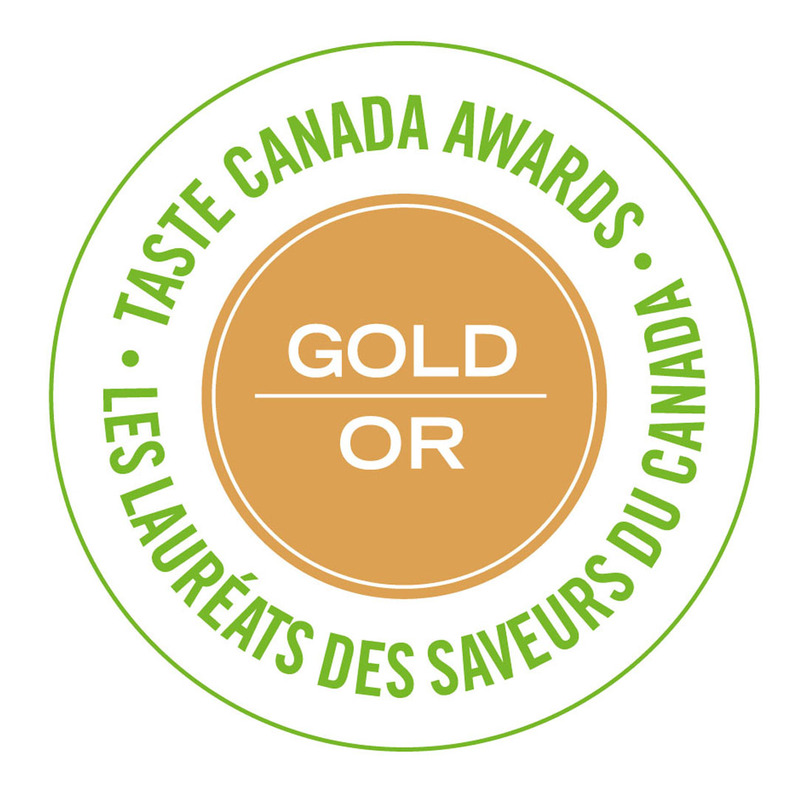 Because Muir Glen uses only the best ingredients in their products, the contest is called Only The Best. To make things fun, tell me ways you have wooed and impressed a loved one with only the best food. Did you make them a special dinner? Did you pack a picnic and eat it under tall trees in the park? I can’t wait to hear your stories! Leave me a comment and a winner will be chosen at random on Sunday June 5th. My apologies to my American friends - the contest is open to Canadians only. So, about these stuffed peppers. I’m not normally a stuffed pepper lover but I quite enjoyed these. The filling is nice and spicy, thanks to the heat from the serrano pepper and smoked paprika. Not over the top spicy, but just enough heat so you can still taste the rest of the flavours. Adding a can of the Muir Glen fire roasted crushed tomatoes was fantastic. They taste so wonderful on their own, I was plucking them out of the can and eating them like so. 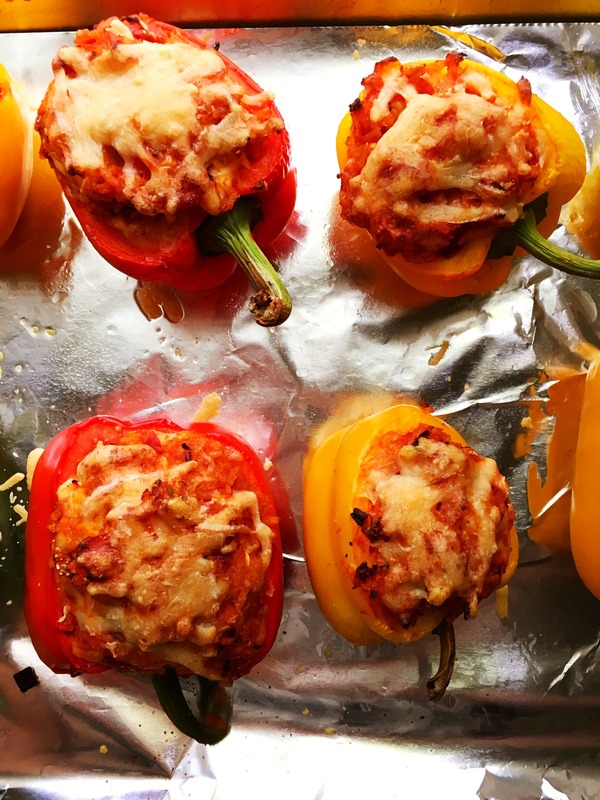 Pepper jack cheese is stirred into the rice mixture, and the peppers are stuffed generously. Oh! I learned that if you slice a side off of the pepper and stuff it that way rather than slicing off the top, they lay nice and flat on the baking sheet. Just scoop out the seeds and leave the stem attached for a lovely presentation. Garnish with some grated Parmesan cheese and bake for just 30 minutes. These are best served nice and hot. Eating them outside is purely optional, though highly recommended. Note: This is a sponsored post. Muir Glen compensated me financially and with product. The recipe is theirs. All opinions are my own, as always. Heat the oil in a Dutch oven over medium heat. Add the onions, garlic and serrano pepper and cook for about 5 minutes until the vegetables are soft. Stir in the smoked paprika and season with salt and pepper. Add the rice, the can of Muir Glen fire roasted crushed tomatoes and water. Bring to a simmer, reduce the heat to low, cover and cook for about 15-20 minutes until the rice has absorbed the liquid. Remove the rice from the heat. Let it cool down for about 15 minutes, then stir in the shredded pepper jack cheese. Season with salt and pepper to taste. Preheat the oven to 350F. Slice the side off each pepper so that it will lie flat on the baking sheet. Scoop out the seeds with your fingers or a small spoon. Divide the rice and cheese mixture between the peppers and top with the grated Parmesan. Bake for about 30 minutes until the peppers are cooked through. Serve immediately. Makes 6-8 servings. Since I grow my own tomatoes, I don't usually buy canned tomatoes. But I do buy fire roasted ones because I love the depth of flavour they add to things! Even my tomato hater husband loves the soup I made with big chunks of fire roasted tomatoes In them! Anyways.. On to winning.. ;) the best bison steaks I ever cooked were for my now husband. It was one of our first dates and I was super nervous, but I pulled it off, he was impressed and we had a glorious evening at the EX afterwards! While my hubby and I were just starting to date, he had mentioned that his all time favourite food was lasagna. One day I decided to surprise him by making one for him...I found the best recipe online and spent around $40 to make it and it felt like it weighed around 10lbs LOL. He loved it! I am also very curious about the handsome man. I guess I'll have to continue reading posts to see if he turns up again. 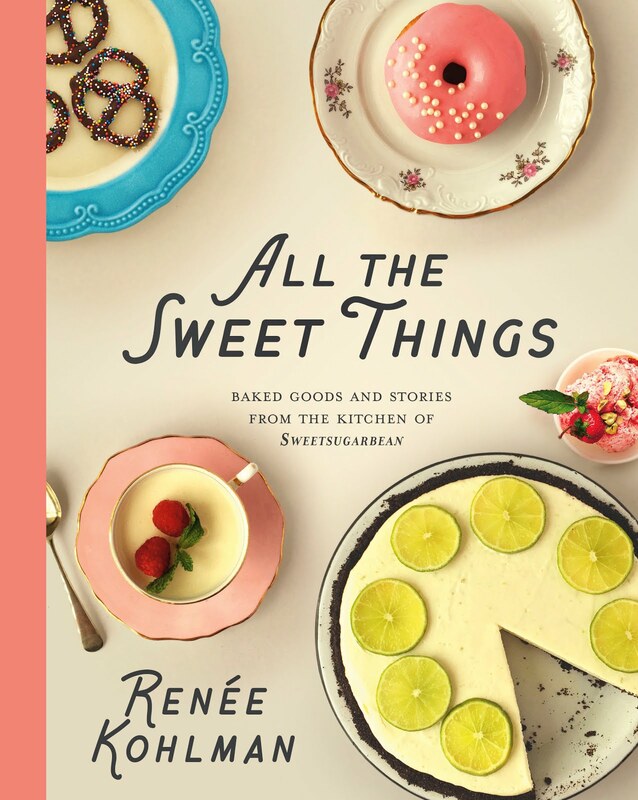 Yummy recipe and a great giveaway. Would love to try the Muir Glen tomatoes. Thanks! I have wooed my loved ones with a pasta dish I created. It has bacon in it (need I say more!). It has turned out to be a family favourite. I usually read your newsletter in my e-mail and don't come to comment. these are gorgeous photos. My mother was always the stuffed pepper expert I've never been able to pull them off. I will need to try these and follow the recipe exactly. Hi Lynn, thanks for your response! It's always a treat to have someone cook for you, isn't it? Chicken cacciatore is the first dinner I shared with my honey... but he made it for me. (And I was impressed.) Over the decades, I've made more than my share of lovely dinners, but my memory conjures only the lovely dinners he has made for me. Cochinita pibil was his most recent discovery. I love a man who can cook! You're a lucky woman, sounds like! I had to google cochinita pibil... sounds delicious! LOL! Better late than never, Linda! I hope you enjoy the peppers! Kim, that is so sweet! You're a wonderful mom (and wife!). My "loved one" is my dad! For Father's Day a couple years ago, he wanted to spend the day with us on the lake in his boat, which for convenience we usually only have hot dogs on the small portable propane grill for lunch. But we wanted to give him a gourmet meal, so beforehand made a bbq beef tenderloin, roasted veg & potatoes, wrapped it in foil. When he asked us where the hot dogs were, we surprised him with his feast which we reheated on the boat grill, & all dined like kings in the middle of the lake! It was his favorite Father's Day! Oh my gosh, Krista! I love this story. How thoughtful and memorable. Good for you guys! I made a Chicken Parmesan for his birthday a few years back and it has now become a request each year, as well as on other days. I would love to try their Fire Roasted Crushed Tomatoes in the recipe. I love Chicken Parmesan - and I bet the fire roasted tomatoes would be delicious in the recipe. Good luck! Tomato sandwiches that we used to make for lunch when we were building our house the first summer we were married. I'd pack a cooler with all we needed for the day. It was our first garden together and we were so happy. I still remember the soggy tomato sandwiches I ate as a kid and these reminded me so much of them. Now our kids enjoy them! The roasted peppers look wonderful. I am going to have to try them soon. I can't remember the first special meal I cooked for my hubby, but likely one of his all time favorites was a birthday dinner, roast beef done on the rotisserie, grilled potatoes & veg & a homemade ice cream cake for dessert. I managed to keep the cake hidden for several days through the various stages of preparation. It was every bit as good as the ones from DQ.